What kind of template are you using on your blog? It may be a official Blogger template or custom template. However most probably you are using a traditional template. Actually I call it traditional 'cause your blog structure goes with a header, body including sidebars and a footer with predefined template. Have you ever think about giving a fresh new look for your blog with a new template. Sort of techy process for you but changes are what we call motivation pills for your readers. You need a change sometimes so your template. Time to time you may try different widgets, styles and kind of design stuff on your blog. That's really good, I appreciate you. But did you ever try out Dynamic Views for your blog? Dynamic Views are not type of gadgets you gonna implement. They are actually new ways for you to present your content for your readers. It's totally a unique and interactive browser experience. Simply I'd say they are another kind of templates offered by Blogger. That makes sense, right? Yeah, I ll make it more clear for you. Here we go for a video clip demonstrate Dynamic Views and how they different from each other. Awesome. isn't it? Further you can experience Blogger dynamic views live at Blogger Buzz blog. As you seen on above video, there are 7 Dynamic Views you can try out. These are all glossy and interactive layouts exposed to latest web technologies. Also these views will load faster and adds more exposure to archived or old posts by displaying older entries on the surface. 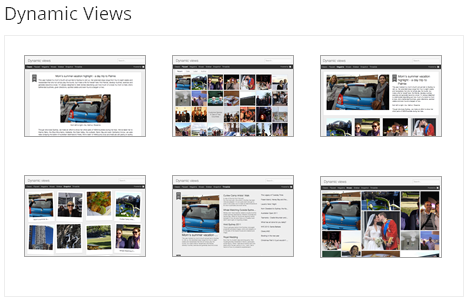 Dynamic views featured with integrated search, sorting by date, label and author, light-box style posts, keyboard shortcuts and sharing made available to Google+, Facebook and Twitter. If you plan to switch to one of these glossy layouts, you won't be able to add any type of custom widgets to your layout as you prefer you can add widgets to your blog but not like the way you were able to in traditional templates. Currently, Blogger support some of important gadgets on dynamic views. However Blogger working on making all other widgets compatible for dynamic views. You can hear about them sooner or later. So if you love to have a dynamic view for your blog and you are not much considering about adding all the widgets, now it's time for you to switch to a dynamic view. * Your blog feeds (posts and comment) should be fully enabled. If you are not sure about that, read How to Change Your Feed Settings in Blogger. * Make sure your blog is not restricted from public and it's available for anybody. If you don't know how to check it out, read How to Set Up Who Can Read Your Blog in Blogger. * If all above prerequisites are true, then just append /view to end of your blog URL and see how it looks like when it comes to dynamic view. If you're happy with new template, you can proceed with steps and make it default template for your blog. 1. Go to Blogger Dashboard. 2. Click on your Blog Title. 3. Navigate to Template tab. Note: Before make changes to your template, you may want to save a copy of it. Read How to Back Up Your Template. 4. There you will find set of dynamic views available. Select most suitable dynamic view for your blog. If you wanna see live preview before applying it, just click on one of dynamic view and you will see a live preview of your blog with selected dynamic view. Click Apply to Blog button if you ready to go live with a dynamic view. Note: Eventhough you set a default dynamic view for your readers, they can still switch to a different view while they reading your blog. * After selecting a dynamic view, you can still switch back to previous template by using Revert to previous template option at Template tab. * Make sure to customize your blog header, background and favorites icon too. Awesome! Thanks for coming by and taking your time to read this post :) I hope you have learnt something today. Now you can share it with your friends and I'd love to hear from you too. * Make sure your comment is genuine and comply with our commenting guidelines. * Review your email and reply notification settings to receive replies via email. 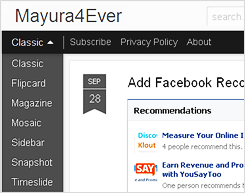 Mayura, I have another blogspot with the dynamic views and haven't played around with it enough. I do like the styling though. I do miss the use of widgets on it! You cannot have followers without it (I believe). Thoughts of on that? Thanks for the info here. Yeah Lisa :) That's obvious. With dynamic views still you have no access to template. But Blogger now optimizing official Blogger widgets for them. As you can see now, Blogger indicates widgets support for dynamic views at gadget list. Followers, Subscriptions, Google+ badge and few more already optimized and you can count on more soon. And share buttons are already with posts there. As we have no access on template, we got to make use of available widgets and if you wanna add scripts kind of things, use Layout tab. Hi friends.Ity's nice that found such a blog on such an interesting theme. Will share it.Just waiting for the next interesting post you'll submit. THANKS FOR GIVING SUCH USEFUL INFORMATION. I want to change to Dynamic views but out of 7 different views that it provides,I want only three of them displayed with names changes(e.g. Flipcard - Photo frame or so..) otherwise it will confuse my visitors. Are you using Dynamic Views on your blog? :) Previous ones are Layout templates where you can customize blog as you prefer. If you wanna revert to layout templates, read How to Change Your Blog Template in Blogger. I just did the dynamics view , fix the title , the image ........all things I thought I could not do because of your great instructions ! Thanks ! I have changed my blog to Dynamic View as well. It's a little annoying you don't have all the options that you used to have anymore, but: the Dynamic View looks great and is a buig and instant refresher to my blog. I do wonder about one thing though: is it really faster to load? With my Wifi-connection my own blog takes me approx. 5 seconds now. Not good! What are your experiences? Yeah mate, it doesn't support all the gadgets there and we can't add custom widgets either. It depends on the connection, content and browser sometimes, but generally Dynamic Views are faster to load from my experience. My blog is displaying only 25 posts where actually am having more than 50 posts. Could you please help me out to display all the posts in my blog for Dynamic Sidebar View? Just click on 25th post from left sidebar and scroll down a bit. You will start to see older posts :) That's how it works on Dynamic Views. Facebook usually shows off confirm action if they detect any unusual behavior of Like buttons at your blog. So your domain has been flagged. For example constant liking and disliking can cause it as they believe someone is trying to increase the count of likes. It can be you or someone else. Anyway once automated system notifies about such action, confirmation comes up. You can't change this by yourself, but file a bug report and you might able to resolve it :) But it will take time though. Hey Mayura, How are you? Gonna to ask you some question, because It was confused me so badly. 1. On Dynamic Classic Template, bellow my headline there is a black box that contained : "home" and the menu to change my blog view style. But why sometimes when I open my page, sometimes come up and sometimes don't? Is there any mistake with my setting? 2. How I could modify the black box below my headline? Because I want to add some tab but did not find how to modify the tab and how to write the content on that tab also. Sorry for keep you waiting for a reply here mate! I've been away for a while. Be the first to know! Get latest blog updates right into you inbox. Copyright © 2011 - 2019 Mayura4Ever. All Rights Reserved. Designed by Mayura De Silva. Powered by Blogger.